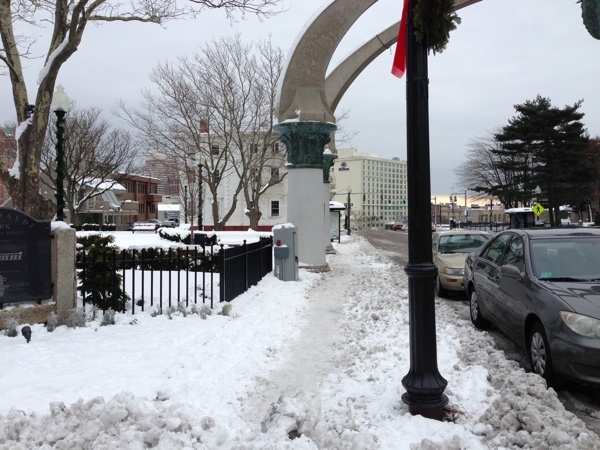 Unfortunately, privatizing Garibaldi Park did not translate into the adjacent sidewalk being cleared of snow. As when the City was responsible for its maintenance, I had to walk in the street this morning. Also, per usual, Lamar continues to fail to clear the snow from the bus stop here (and elsewhere I’m sure). 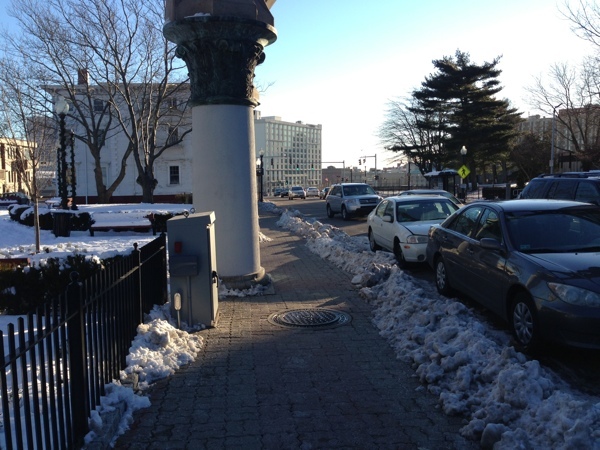 Update: Better late than never, as of Wednesday morning, the sidewalk is clear. The sidewalk has not been cleared since the blizzard. People walking in the street. Bus stop blocked with 4 feet of snow. I have the same problem with the bus shelter up between Knight and Vinton on Atwells… and the park at the corner of Sutton and Atwells. I wait for the trolley at one of those two stops multiple times a day, and neither is clear. I twisted my ankle trying to climb over the mounds of snow in front of the Lamar shelter… and could only access it at all because the parking lot behind it was cleared. The bus shelter in Centerdale is also blocked as are so many. But I was told definiteively that Lamar’s contract does not require them to clear the shelters from snow. RIDOT sys it is not their responsibility. RIPTA does not have the equipment, staff, or money to do it. It is helpful to call attention to the problem, but I don’t see a solution in sight. In my opinion, clearing bus stops should be just as much a municipal responsibility as clearing the roads, a “complete streets” concept that Providence and many other towns signed onto. On state roads, the same principle should apply to RIDOT. Yes this will require tax rvenue, just as tax revenue is required to clear the roads. Back in 2009 a RIPTA representative told us that Lamar was responsible for removing snow from the shelters, but not the sidewalk around them. Down here, the bus shelter ad companies also take the position of not being responsible for litter removal. Same goes for the Washington Area Mass Transit Authority, Virginia Department of Transportation, and Fairfax County–basically anyone who COULD be responsible claims not to be. If someone could figure out who is responsible for bus stops/bus shelters/sidewalks at the same, you would probably win a nobel peace prize.